Is it possible to retrieve Calendar from iOS 8.4 updated iPhone or iPad? You can selectively recover the calendar directly from your iOS 8.4 iPhone with iFonebox when you lost or delete the calendar by mistake. As one of the core apps preinstalled with iOS 8.4, Calendar serves as an important tool to keep track of daily work, for example what you are going to do and when you need to finish it. And probably you may use Calendar to remind you of important data like anniversaries and family birthdays etc so that you won’t forget to prepare gift and celebrate with your beloved ones. The Calendar therefore plays terribly important role in our daily life and we cannot afford losing the calendar or deleting it by mistake. Our life will be messed up without the detailed arranged calendar. Usually we will turn to iTunes for help, since we have created backup with iTunes to our computer and you restore your lost calendar from the iTunes backup file. Restoring lost data from iTunes backup, however, may result in data overlapping and permanent wiping. 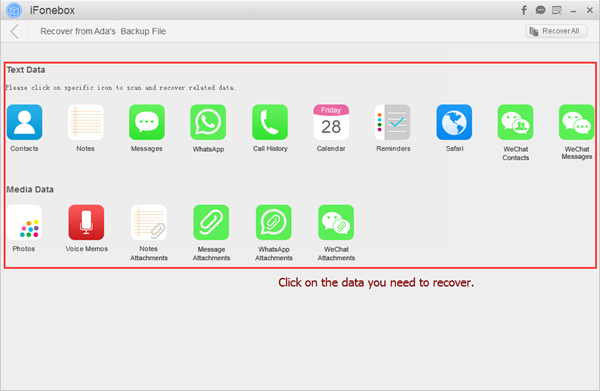 Fortunately, there is an easier way to selectively recover the lost calendar from iOS 8.4 iPhone or iPad directly. iFonebox is the very solution that makes selectively recovering lost calendar possible and avoiding data overriding possible. You can refer to the product page to learn more information about iFonebox. Or you can download a free trial version to have a try, but you need to pay for the registered version to successfully recover the lost calendar. And I am going to show you how to recover the lost or deleted calendar from iPhone or iPad running iOS 8.4 step by step. Install and launch the full version of iFonebox, and then plug in your iOS 8.4 iPhone or iPad to your computer. Click “Start” to start off. 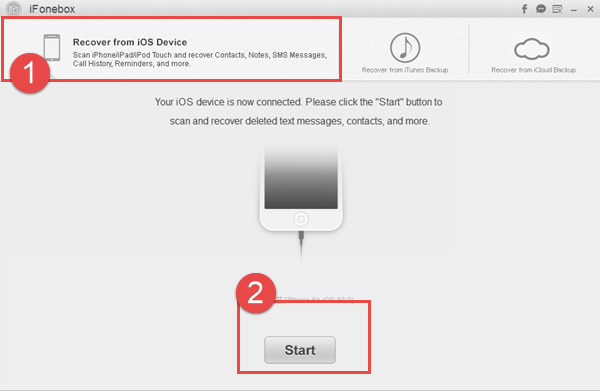 By doing so, you have chosen “Recover from iOS Devices”. Click on the icon of Calendar to extract the calendar from your iPhone or iPad running iOS 8.4. 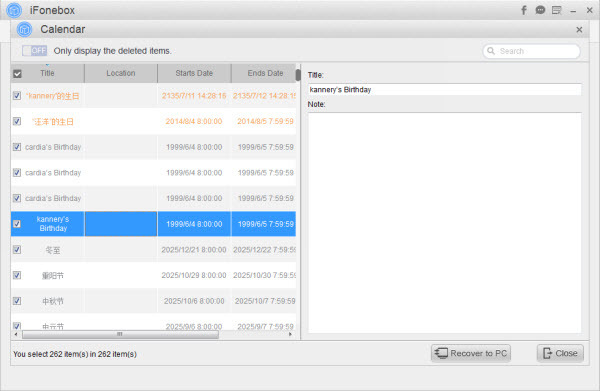 When you finished exporting the calendar with iFonebox, you can click to recover to your computer. In addition, you can do some editing about the Calendar before transferring to your computer.